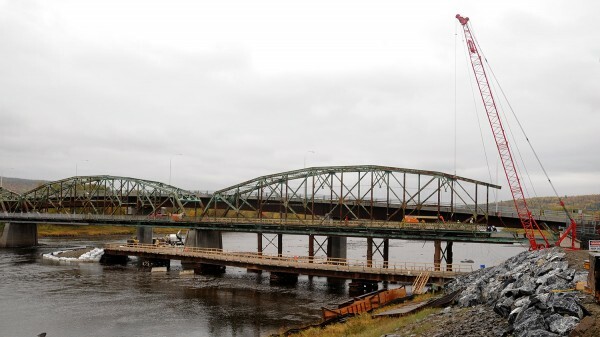 Crews continue on Monday to tear down the old international bridge that connected Clair, New Brunswick, and Fort Kent. 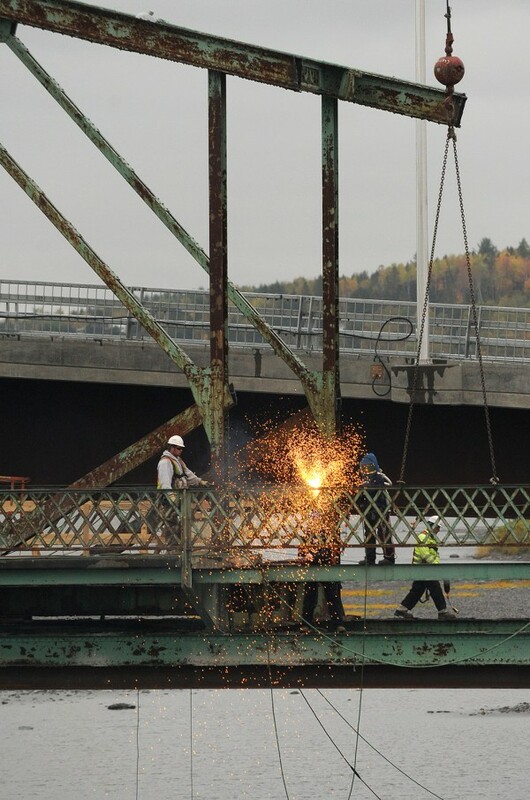 Crews work on Monday to tear down the old international bridge that connected Clair, New Brunswick, and Fort Kent. FORT KENT, Maine — Work has begun to remove the former international bridge that was replaced this summer by a new concrete span connecting Maine to Clair, New Brunswick. Reed and Reed Inc. of Woolwich is taking the bridge down as part of a $3.1 million contract, according to Judy Cole, spokeswoman for the New Brunswick Department of Transportation and Infrastructure, the lead agency on the project. Reed & Reed also is working to replace the Fort Kent municipal wastewater discharge pipe that was damaged in 2012 during the bridge construction phase, according to Jennifer Paul, Maine Department of Transportation multimodal program construction manager. Differences between GPS systems in the U.S. and Canada led to a mapping error that caused workers to sever the pipe carrying treated effluent from the treatment plant. Since the effluent is treated before being discharged into the St. John River, the mishap posed no environmental hazard, officials said at the time. But the pipe still needed to be repaired and routed around the new bridge piers to avoid possible erosion. Paul did not know how much the pipe repairs added to the cost of the demolition project, but she said the expense was being shared equally by the two countries. That cost was included in the $3.1 million contract awarded to Reed and Reed, Cole said Tuesday. Permits issued by the U.S. Army Corps of Engineers and the Maine Department of Environmental Protection require all work on the pipe be completed by the middle of October, Paul said. Cole said Tuesday that the piers from the old bridge will be removed by March 2015 before the annual thaw and ice-jam season. Last spring, officials were concerned that ice running in the river could jam up between the piers of the old bridge and the new one 15 feet downriver, damming the waterway and creating flood conditions. About 1,900 vehicles routinely cross the border here daily, according to a Maine DOT study. In 2009, the agency determined that wear and tear on the 84-year-old, 730-foot-long steel truss-style bridge was making it unsafe for the existing traffic flow. The new four-span, steel-beam bridge is 25 feet wider than the old one and includes three in-river piers and two abutments. The $14.7 million cost in U.S. dollars for the new bridge was split evenly by Maine and New Brunswick. Another $4.2 million contract to build the U.S. approach ramp was awarded last year to Soderburg Construction out of Caribou. Work continues on that approach ramp with additional work being done on sidewalks, paving and curbing. The entire project is scheduled to wrap up next June, Cole and Paul said.